[Phil] had a bunch of Shiftbrite modules set aside for an LED table project, but before he could get around to it, he decided to use them to build a prop for his friend’s bachelor party. Expecting plenty of drunken revelry, he constructed the Arduino Wine-o-Meter – a carnival “Test your strength” style breathalyzer. 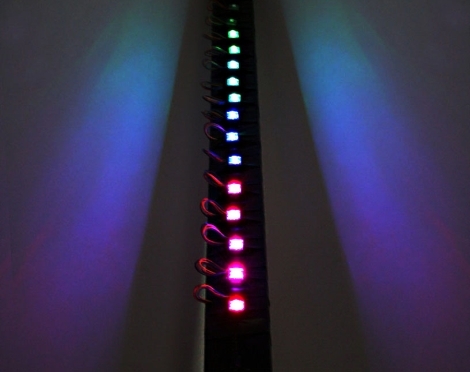 The 25 Shiftbrite modules are lined up in a column, which is connected to an Arduino tucked away in a cardboard box. The Arduino takes readings from an MQ-3 Gas/Alcohol sensor was salvaged from another breathalyzer build [Phil] put together. While it has been noted in the past that this sensor is pretty inaccurate, it seems to serve his purposes quite well. Since his game is based on measuring the players’ blood alcohol content in relation to one another rather than obtaining an exact BAC reading, the poor calibration of the device should affect everyone equally. It looks pretty cool, and we imagine that it will ensure that the party stays lively throughout the wee hours of the night. Check out the video below to see [Phil] walk you through a demo of his Wine-o-Meter. ← Do you know what you’re doing when integrating PC-side apps with USB microcontrollers? You can get just as accurate a drunk-o-meter by sticking a ruler in the toilet the morning after, although you won’t be having (heaving) as much fun. You’re doing it wrong! You should have taken a swig from that flask before blowing in the second time :). So did the light color from the LED bar enhance the appearance of the exotic dancers? Not true because BAC does not affect everyone equally. Some people are functional after drinking a fifth of vodka…I can’t even stand after drinking 5 beers. Could be dangerous if people at the party are dumb enough to take the perceived BAC at face value and get into a car thinking they can drive. A little bit safer during the New Year’s celebration!